Cover of My Antonia (Signet Classic)Willa Cather (1873-1947) lived most of his adult life in or near New York City, but used memories of her early years on the plains of Nebraska as the source of her literary work. Her first popular success came with her novel My Antonia (1918), based on her childhood in the plains semiautobiographical fashion. 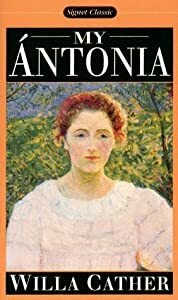 My Antonia (1918), generally considered her finest novel, is based on a successful city lawyer's reflections on his prairie boyhood and his love for Antonia Shimerda, a warm, vibrant Bohemian girl. People and nature are seen as two protagonists in a dark cosmic drama, with love of pasture and landscape coming alive in her prose. Willa Cather was born in Winchester, Va., but at the age of 9 moved to Nebraska, where her father had bought a farm. The stark grandeur of the prairie and her first-hand knowledge of the life of the Bohemian and Scandinavian immigrants supplied her with both the material and peculiar manner of expression for her novels. Although she was educated largely by her mother, her knowledge of English literature and Latin was sufficient for her to do just fine at the University of Nebraska. Leaving the prairie for the first time in 1900, she moved to Pittsburgh and found employment as editor, drama critic, and high school teacher. In her last years Cather devoted himself to literary criticism. Under Forty (1936) contains an eloquent expression of her philosophy of writing. In her later novels she explored the experiences of other early settlers in America, two of the best of these are Death Comes to the Archbishop (1927), and Shadows on the Rock (1931). As the years go by, more books and articles that dwell on Cather’s sexuality are appearing. One in particular documents her relationship with a beloved friend Louise Pound. And after her affair with Pound ended, she picked up with Isabelle McClung, and later with Edith Lewis. Yet there’s no public record that she admitted to being a lesbian. Cather never married. She died on April 24, 1947, in New York City. Comments on "Becoming a Writer: Willa Cather, a Brief Bio"